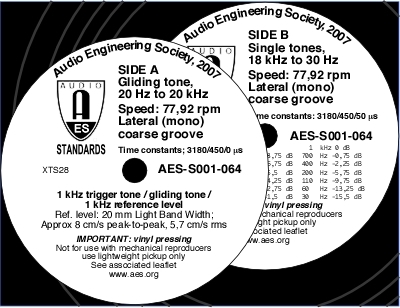 Recognising an international need for calibration tools, the AES Standards Working Group on Transfer Technologies (SC-03-02) initiated a project to calibration playback equipment for coarse-groove 78 rpm records. The result is now available as a boxed set of two identical 12-inch vinyl discs, catalogue number AES-S001-064. The two discs allow one to be used as a day-to-day working tool while the other may be stored as a master reference. Private collectors will be able to refine their appreciation of their vintage collections. Further details on the content, origins, and use of this Calibration Disc Set may be found on the AES Standards Web site. This is a limited pressing of 500 sets in highest-purity vinyl. When this batch has gone, we hope to be able to order a second pressing. Because the supply of suitable vinyl material, and the availability of coarse-groove pressing, to achieve reference quality is becoming scarce, we cannot guarantee that these discs will be available in the future. If coarse-groove records are important to you, you should act now. IMPORTANT: This is a vinyl pressing and is not for use with mechanical reproducers or earlier electrical pickups using steel styli. Use a lightweight pickup only.